It is with a very heavy heart that we share the sad news of the passing of our beloved founder, Bardi McLennan. Bardi McLennan, 91 of Newtown Ct passed away peacefully surrounded by her family on Oct 27, 2017. Anyone who knew Bardi would know that she would not like to be fussed over. That said, she led a remarkable life. Bardi, a lifelong Connecticut resident was born in Woodbury, CT, on March 4, 1926. Her father, was born in Bohemia in 1870, traveled extensively, lived in Russia, rode in the cavalry with the Cossacks, and spoke seven languages. Bardi used to tell stories of her father riding Lipizzaner horses, the types of horses who prance in highly-controlled, stylized jumps and other movements known as the “airs above the ground.” When her father came to America, he had a kennel of French bulldogs. It was the start of her lifelong love of dogs. Bardi had adventures of her own, travelling to England during the war at the age of 17 in a convoy of Liberty ships that crossed the Atlantic. 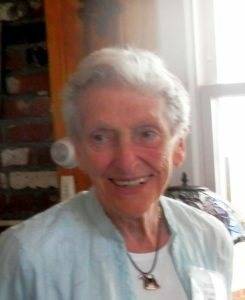 She ended up working for the U.S. Army in England during World War II. She met and married a Royal Air Force pilot at the tender age of 19. From these colorful beginnings, Bardi became the perfect blend of writer, consummate dog person, and Welsh Terrier fancier. Her passions, writing and dogs, defined her life. For 18 years, Bardi, while raising her children in Connecticut, was the editorial assistant to etiquette queen Amy Vanderbilt. While working for Miss Vanderbilt, Bardi not only wrote many of the columns for McCall’s, & Ladies Home Journal, she continued writing them for many years after Ms. Vanderbilt’s death. After she had her fill of etiquette advice, what did Bardi do? She answered yet another newspaper ad for a researcher, for popular novelist Erica Jong. After this stint, Bardi said she was able to focus on her first love, writing about dogs. She teamed up with her son Douglas, to write and produce a series of radio spots called the Canine Minute for WMMM 1260am in Westport CT. They then went on to create the first audio tapes on Canine Care under the Canine Consultant brand– training humans to be responsible pet owners, marketing them through pet retailers across the USA. Bardi quickly met with the top publishers in the pet industry, who recognized her talent. Write about dogs she did. Bardi was the author of more than a dozen books about dogs, puppies, children, and various terrier breeds. A winner of the 1991 Kal Kan Pedigree Award for outstanding journalism on pet care, Bardi penned the advice column “Ask Dog Fancy” for Dog Fancy magazine for 15 years, the most responded to column in the magazines history. Based on those columns, she wrote a book of the same name. She also wrote feature articles for the AKC Gazette, all major canine publications and trade magazines. Bardi won several top awards from the Dog Writers Association of America. Her bestselling “The Welsh Terrier Leads the Way” was the first definitive book on the breed. She also had a long-running column in the Newtown Bee newspaper up until 2012. “Taffy was a Welshman, Taffy was a thief. As Bardi wrote, “That, dear friends, is how my handsome Felstead Welsh Terrier came to be named ‘Bandit.’” Felstead Kennels in Wales was the creator of the breed. Bardi, along with four other Welsh Terrier Club of America members formed the Glyndwr Welsh Terrier Club in January 1977. GWTC was her passion and she truly loved attending the events when she could and cheering us all on from her home. She was extraordinarily connected to all things Welsh Terrier – it surely seemed as if everyone either heard of her or knew her. With a mind as sharp as a tack until her last day, she kept tabs on the results of all the shows, as well as all the dog news. When she wasn’t watching dog shows, she kept up with the Kentucky Derby and Triple Crown races and televised tennis matches. Mostly, she loved Welsh Terriers. Catherine Violet Hubbard Foundation Inc.